President Donald Trump listens to Italian Prime Minister Giuseppe Conte during a news conference in the East Room of the White House, in Washington, July 30, 2018. U.S. President Donald Trump on Monday made his most explicit statement yet that he is open to direct talks with Iran. Trump, in the White House East Room during a joint news conference with Italian Prime Minister Giuseppe Conte, was asked by a reporter if he would be willing to meet with Iranian President Hassan Rouhani. Later, in an interview with the cable television network CNBC, Secretary of State Mike Pompeo said Trump is prepared to sit down with the Iranians if they "make fundamental changes in how they treat their own people, reduce their malign behavior," and agree it is worthwhile to put in place a nuclear agreement "that actually prevents proliferation." 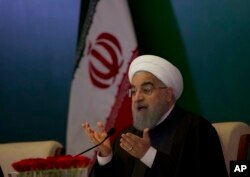 FILE - Iranian President Hassan Rouhani speaks during a meeting with Muslims leaders and scholars in Hyderabad, India, Feb. 15, 2018. Iran responded by saying the path to direct discussions with Washington would have to include the United States returning to the Joint Comprehensive Plan of Action (JCPOA), as the nuclear deal between Iran and six world powers was formally called. “I don’t think it will happen in the immediate future,” said Jarrett Blanc, senior fellow of the Geoeconomics and Strategy Program at the Carnegie Endowment for International Peace. Iran, with a more complicated domestic political structure than the totalitarian model of North Korea, has been cool to the idea of diplomacy with Washington, more so since Trump pulled the United States out of the multinational deal known as the Joint Comprehensive Plan of Action, which imposed restrictions on Iran's ability to build nuclear weapons in exchange for sanctions relief. "Iranian leadership has presented Trump as a bully and has presented the U.S. withdrawal from the nuclear deal as a betrayal of trust. So it’s really hard for the Iranian leadership to now turn around and start negotiation from scratch," said Shahram Akbarzedeh, a research professor in Middle East and Central Asian Politics at Australia's Deakin University. Just hours before that tweet, Rouhani had warned Trump’s policies could lead to "the mother of all wars." “No Iranian leader is likely in the near future to meet with a president who has repeatedly threatened Iran, insulted its leadership and violated the nuclear deal,” said Ali Vaez, Iran project director at the International Crisis Group. Officials in Tehran, earlier in the day prior to the Trump-Conte joint news conference, explicitly ruled out any talks with Washington. "With current America and these policies, there will definitely not be the possibility of dialog and engagement, and the United States has shown that it is totally unreliable," Iranian Foreign Ministry spokesman Bahram Qasemi told reporters. Blanc said he views Trump’s offer as very much in line with Trump’s desired approach to solving global issues. Unlike Trump’s quickie summit in Singapore with Kim, after which he declared he had solved the nuclear issue with North Korea, any such pronouncements by the U.S. president following a meeting with an Iranian leader would be heavily scrutinized, and any accommodations likely intensely criticized by Tehran’s foes. “Even if Donald Trump, with the laws of pol gravity suspended, goes to Lausanne or wherever and meets Rouhani and claims to have solved the nuclear issue, he would get hammered by the Saudis, Israelis and Washington’s war hawks,” Blanc predicted. For some analysts, Trump’s approach is more moderate than that of some of his top advisers, such as National Security Advisor John Bolton. “I do not have the impression that he is actually seeking a war with Iran,” Blanc said of Trump. “But I do worry very much belligerent rhetoric doesn’t exist in a vacuum,” and there is a risk of “an accidental conflagration” with Iran.